We'll get ourselves diverted if we begin our discussion with 'is it jam or jamb chucking?' You may see it written either way. A review of the definition of both words will allow proper usage depending on your point of view. We also might confuse things if we suggest that jam chucking is nothing more than using a very stubby mandrel or interference fit friction drive. Let's leave all of those semantic issues aside and explore the incredible potential of the jam chuck method of workholding. In essence, jam chucking acts like a form of both mandrel and friction drive mounting. This workholding method combines the benefits of both. It couples those benefits with the immediate and custom creation when needed. 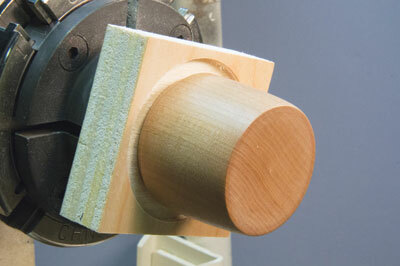 Using a jam chuck has many benefits but the most attractive is the near zero cost of implementation. Jam chucking allows you to use small bits of wood that usually would be destined for the burn pile in a very productive manner. In this article, I will go on to explain what jam chucking is as well as some of the ways to use it; key features to employ it; easy ways to create your own jam chuck; and some ways to maximise the benefits of this useful workholding method. Jam chucking can be explained as simply as either an internal or external 'tuned to need' splitting the wall. With enough wall thickness, you can consider this method provided that your wall geometry allows it. Ideally the bearing surface between the jam chuck and the turning needs to be flush and perpendicular to the axis of rotation. 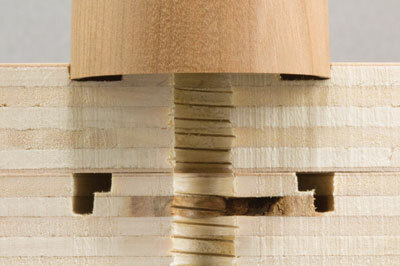 Tapers, either inward or outward, present problems for the inside bearing jam chuck and its ability to provide grip. The tailcentre can assist but it is usually removed partway through the process. Good practice for inside bearing jam chucking is to have walls that are perpendicular to the turning axis for sufficient length for the jam fit to position and secure the turning. 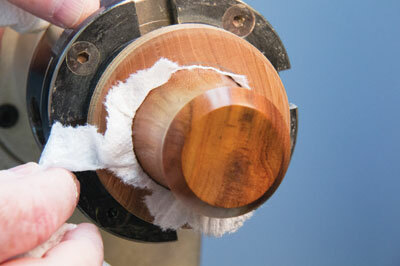 Obviously, if you only need to clean the nubbin from the bottom of the turning and do some light sanding, your bearing surface doesn't require much length or a lot of clamp force to be applied. As usual, leave the tailcentre in play until you need to remove it. It will assist in the clamping and also provide the safest failure mode should something go awry. 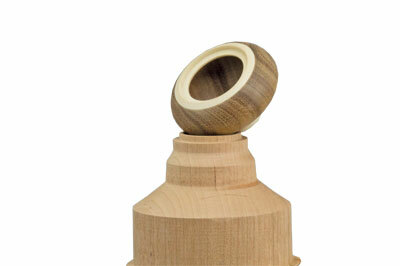 For the most part, outside bearing jam chucking is easier to accomplish with less opportunity to stress and damage your turning. It also offers the design flexibility to have walls that are not perpendicular to the turning axis. The outside bearing jam chuck shortcoming is that the jam chuck bearing area of the turning is inaccessible. That area of the turning needs to be completed prior to engagement in jam chucking. 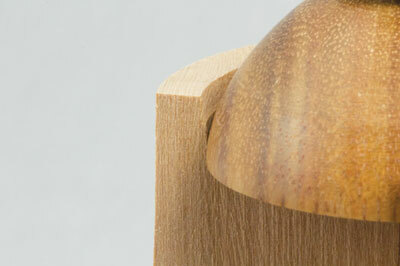 The engaged area needs to be handled gingerly by the jam fit to prevent damage to that surface. is required for all activities. 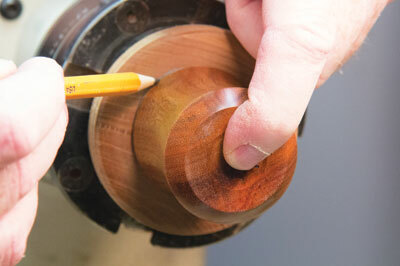 Marking the size for your jam chuck can be as simple as a pencil tracing of your turning or a divider marking. 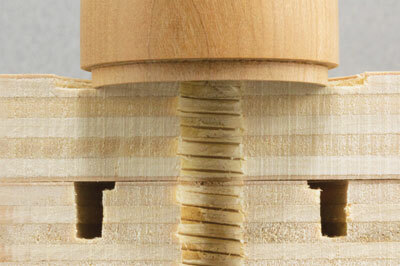 Regardless of an inside or outside fit jam chuck, cutting it is a single sided adjustment. You cut short of the final position and then 'tune' the fit for the desired gripping force. Depending on whether you will be reusing the jam chuck or it is a single use may impact your design of the interference fit. That is, do you want to pop the turning off the jam fit or are you willing to cut it off. A one-time use, cut it off type fit will allow for much more clamp force but does require a bit of forethought. This design requires simple access to the area needing to be cut away. 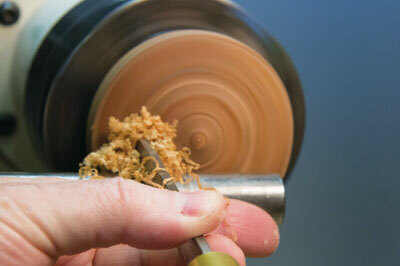 Poor planning will require far more effort on your part to cut and release the turning. Inside jam chucks are rarely a cutaway fit not only because of the geometry but also the much lower interference forces that can be used. 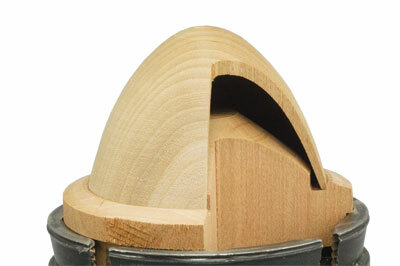 There are a variety of turning tools that you can use to cut your jam chuck to fit but the easiest to use is a parting tool. It offers an easy way to make 90° cuts and straight parallel wall cuts. Other tools can be pressed into service so use what you find the easiest to control. 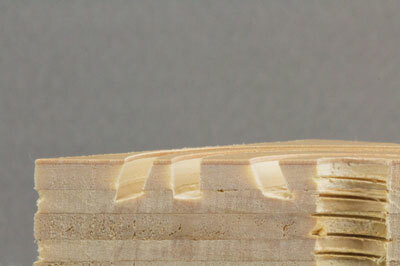 Depending on your method of marking your material being used for your jam chuck, you'll want to creep up on the proper fit. You can cut quickly to the close point and then use a cut and test fit method to tune the final fit. While seemingly tedious, it does go quickly and with practice it only requires a couple of test fits. As you test the fit, you'll be able to achieve the tightness desired based on your subsequent process needs. This is a one sided adjustment so go slowly. Remember that the amount of your cut takes off twice that amount of material. If you've accidentally made the fit a bit too loose for your needs, you have two options. You can re-cut the jam chuck. Leave the original error for reference to let you get close on the next try without going too far. Another option is to tighten the fit. There are a few ways to do this if the looseness isn't too dramatic. You can use a sheet or two of facial tissue, kitchen paper, or similar material. Place it between your workpiece and the jam chuck. The space taken by the tissue will often tighten the fit sufficiently for you to proceed. Another way to tighten things is with moisture. Wetting the jam chuck and then quickly installing the turning often works. 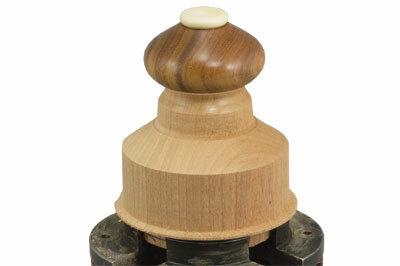 The jam chuck wood will swell and expand tightening the fit. Remember, as the wood dries it will loosen again so plan accordingly. Seeing jam chuck versatility? With planning, it can be taper, chuck, faceplate mounted, and re-useable. Perhaps some truing needed but re-usable. Depending on your needs, you might have a permanent jam chuck and cut your work to fit the jam chuck each time rather than vice versa. 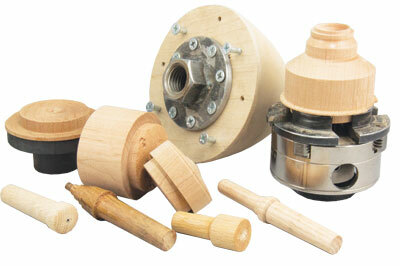 Jam chucks are low cost, easy to use, applicable regardless of size, with clamping force cut to order. What's not to like about a jam chuck?